As the temperatures start to rise, so does your need for a sweet snack that will cool you down. 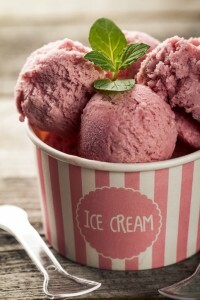 Why not take advantage of the changing season’s plump berries and make some delicious homemade ice cream? There are ice cream recipes for all expert levels, so you can enjoy this chilly treat whether you’re a novice or ice cream-pro. 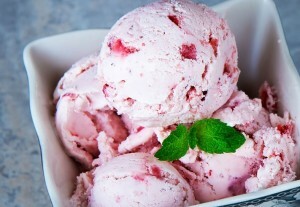 Become the talk of the town with these irresistable berry ice cream recipes. 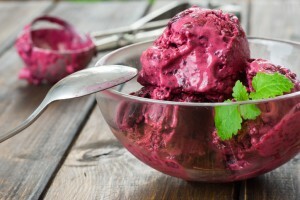 Combine frozen berries, milk and stevia in the bowl of your food processor. Process until smooth. Taste the mixture and adjust sweetener to your taste if needed. You can eat this ice cream straight away (it will have a soft-serve texture). If you’re not planning on eating it now, transfer it to metal tin (I used a loaf pan) and place in the freezer for 2 hours. Stir occasionally for a smoother ice cream. If you’re planning on freezing it for more than 2 hours, take it out of the freezer 5 to 10 minutes before serving to let it soften. In a bowl, mash berries with a fork or potato masher until just slightly chunky. In a saucepan over medium-low heat, bring cream to a simmer with 1/3 cup sugar and the salt. Taste berries and if they are very tart, add 2 tablespoons sugar to saucepan. Simmer, stirring occasionally, until sugar dissolves. Transfer to a bowl, stir in alcohol or liquid sweetener and place in refrigerator or in an ice bath to chill. When cold, pour mixture into ice cream machine. Add berries and churn according to manufacturer’s directions. Transfer to a container and freeze until solid, at least 2 hours. Let sit at room temperature for 5 to 10 minutes before serving, or in refrigerator for 15 to 30. Heat half-and-half and 1 cup sugar in a separate saucepan over low heat. Turn off heat when mixture is totally heated. Add heavy cream to a separate bowl. Beat egg yolks by hand or with an electric mixer until yolks are pale yellow and slightly thick. Temper the egg yolks by slowly drizzling in 1 1/2 cups of hot half-and-half mixture, whisking constantly. After that, pour the egg yolk/half-and-half mixture into the pan containing the rest of the half-and-half mixture. Cook over low to medium-low heat (depending on how hot your stove gets) until quite thick, stirring constantly. Drain custard using a fine mesh strainer, then pour into the bowl with the cream. Stir to combine. Add blackberry juice/puree to the cream/custard mixture and stir. Chill mixture completely, then freeze in an ice cream maker until thick. Place container in freezer to harden for an additional two hours. Can’t wait to try these summer sweets? Hop on over to Reams for all of the ingredients you need at the price you want! And happy cooking!